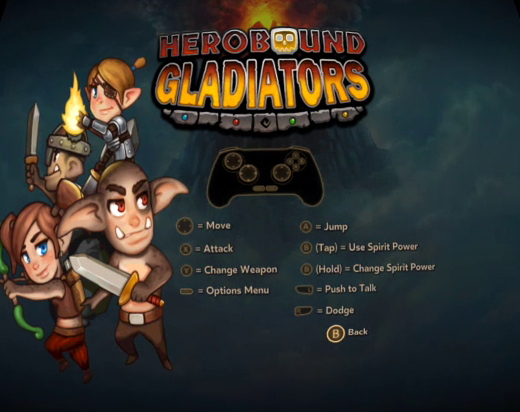 Herobound Gladiators from Gunfire Games and Escalation Studios is an online multiplayer adventure game for Gear VR that puts you up against the ghouls and goblins of the Herobound universe. 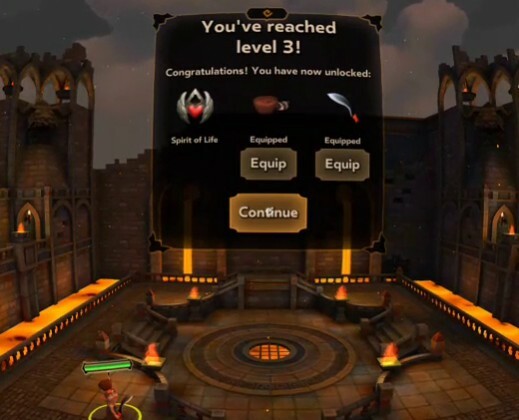 Free play combined with expansive upgrades for weapons and avatars makes it one of the first truly social games to hit the mobile VR platform. The field of battle is essentially played on a tabletop that you and three other people fight around in co-op style. You and your new party, which as of this writing are matched randomly, can use voice chat to strategize the plan of attack as enemies pop out of the ether. Some monsters, like a particularly annoying black mage, can teleport around the board, making coordinated team-play a necessity to get through the never-ending waves. You start out as a lowly level 1 with three basic weapons; a sword, a bow, and a giant hammer that you can cycle through during the match. Each, of course, have their own speed and range abilities so you can shoot a volley of arrows at a hulking beast before smashing him with the slow, but powerful hammer. Or maybe button-mashing the sword is more your thing—it’s really up to you what weapons you choose as you unlock more following successful matches. Unlockable hats (yes, hats) and avatars let you personalize your character, which is reflected in both your own “floating head” and your teeny hero on the battlefield below. 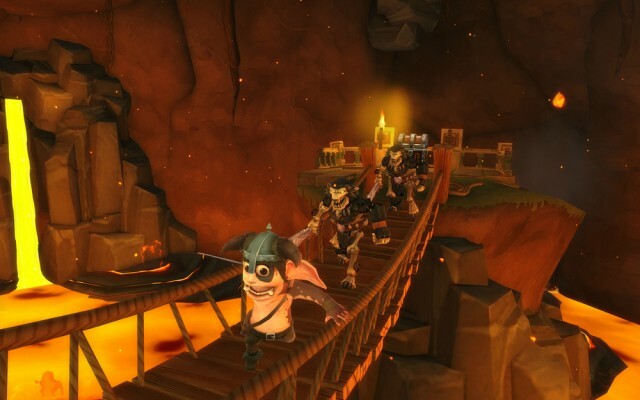 The game offers 16 different arenas in 4 different environments, with 30 enemy classes and 4 unique bosses to keep you guessing. 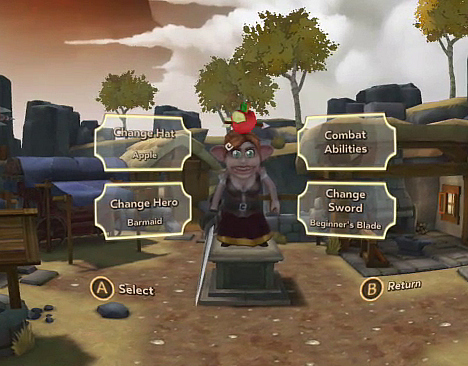 I'm a horrifying barmaid elf with an apple hat. One of 6 characters. Keeping up your guard as mobs naturally attract to you is important, and having a sympathetic archer across the map can really help you keep those hearts up. Picking up gems and hearts dropped by baddies keep you moving forward, and if you die, you can always trade gems for full bar of health so you can get another crack at the action. To add to the chaos, special movies, called ‘Spirit Powers’, can be unlocked to give you leverage over different enemy types. Arena size and terrain varies as you go from match to match, putting you on tropical islands, forest scenes, or crumbling castles with lava moats—very much keeping with Herobound’s well established visual style. The size of the arena coincidentally demands different play styles out of your group, with some maps like a small dojo-style arena populating quickly with mobs. Keeping your sword out for quick slashing is a must in those sorts of close quarters. It seems for now that you can only be matched with strangers, which we’re hoping changes when Oculus flips the switch on their social profile function. Although gameplay is fast-paced, some of the button-mashing can get a little repetitive. If you listen to the video, you can hear my companion unknowingly transmitting his button taps as we furiously slashed through enemies—something I didn’t really notice on first blush, and not at all annoying when you’re in the moment—but it serves as a reminder just how much you’ll be using the controller. You may not want to play this one on the train for fear of quick retaliation. Because it’s a tabletop game and you don’t do any physical locomotion on the board yourself, but rather control a smaller 3rd person avatar, newcomers to VR shouldn’t have a problem comfort-wise with Herobound Gladiators, and quickly be able lock into the game for as long as the dreaded cool-down message allows them to play before popping up. For my Note 4, it was a good 30 minutes of playtime before getting it, which isn’t unusual for the more graphically intense games on the store. Great review Scott! Any chance we see you writing a monthly VR column vrbose style anytime soon? Im sure this would be super popular.